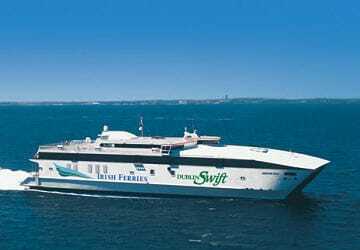 The Swift is Irish ferries fast ferry. 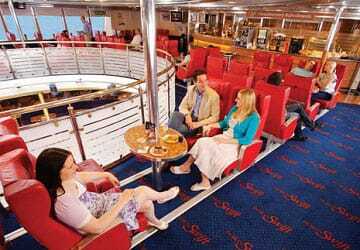 Onboard there is plenty to keep you occupied during the short journey across the Irish Sea including shops, bars, restaurants, a gaming area and a number of lounges. 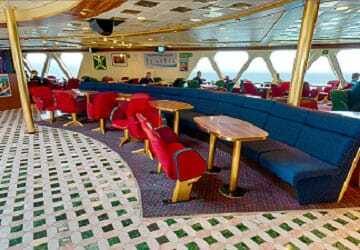 There are no cabins available on this ship however the is a comfortable reserved seating area for those who add the Club class lounge to their booking. The Swift features 2 bars, a brasserie and a cafe. Temple Bar offers a choice of delicious hot and cold snacks from hot dogs and paninies to ice-cream and drinks and of course a full bar service while the Trinity Bar has a great choice of hot and cold snacks. For passengers requiring a restaurant menu Boylan’s Brasserie serves a selection of hot food or alternatively choose from a wide range of sandwiches, rolls, baps and light refreshments at Café Lafayette. 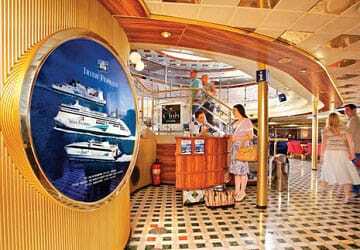 The shop offers passengers the chance to buy gifts and souvenirs for friends and family. You can pick up some great deals in fragrances, fashion and electrical goods. You can relax & enjoy TV in the comfort of the cinema style TV Lounge but for true luxury and comfort upgrade to the Club Class lounge which boasts magnificent sea views and a host of super benefits, such as exclusive lounge bar, reserved seating and 10% off on selected best products in the onboard shop. 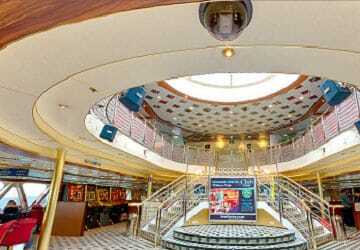 The ship is child friendly but does not have a dedicated childrens play area. 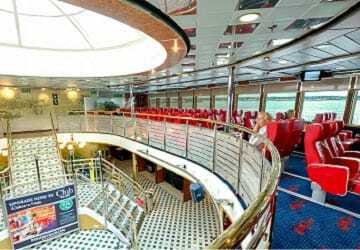 This ship is wheelchair friendly however the Club Class Lounge is not accessible to wheelchair users as access is only available by stairs. Please Note: Whilst we have taken great care in making our Dublin Swift guide as accurate as possible, onboard facilities, services and entertainment may vary depending on the date and time of year that you travel, facilities mentioned may change without notification and ferry companies reserve the right to operate vessels other than those mentioned at time of booking without prior notification. Late departure (20min) due to engine trouble and further delay (25min) en route not explained. Not a disaster and delays can be a price to be paid for risking the crossing on the fast boat. I do have one complaint. 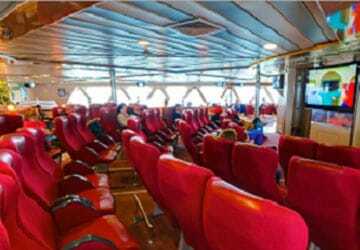 The passenger deck was too cold. I realise the air has to be circulated but why waste energy bringing the temperature down to an uncomfortable level? Having registered my mobile number meant we were advised of a delay to our departure and this helped us understand what was happening and how long we were to wait, being only forty five minutes was not a problem. 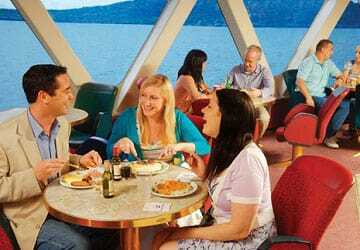 The journey was very smooth and the staff very helpful. Seating in the Club area is worth the little extra it costs. Our journey on return was on time and very comfortable. 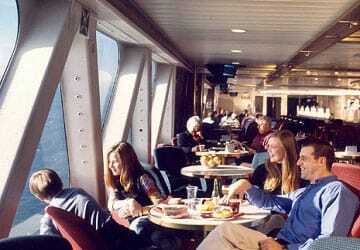 "Good facilities but very choppy crossing"
The facilities are very good and the trip only takes about two hours. However, we were a little unlucky, going to Ireland mid-September, to get a very choppy crossing going over and my wife was not feeling too well - it was however fine coming back. It was so rough in fact that the next crossing was cancelled, just bad timing really. 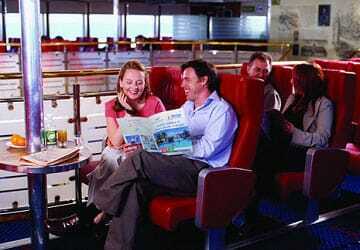 I found the whole process of travelling on this ferry very easy and efficient, from booking in to driving off. 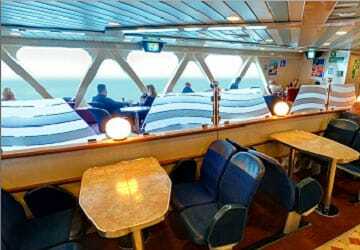 The reserved seating area and the seat itself were comfortable and I would not hesitate to use this ferry again. I really enjoy my self so comfortable. Have already recommended it to all my friends. The directions on where to go and what to do were straight forward and the staff was friendly. Had a text day before we were due to sale that it was cancelled, were given two different times to sail there organisation was great. And we were kept well informed and up dated. 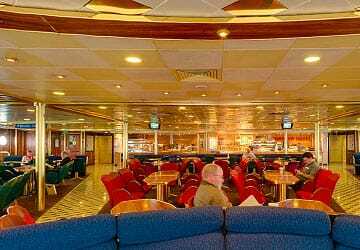 We crossed from Dublin to Holyhead on Tues 20th Sept. No problems what so ever. The ferry was clean and on time; a pleasant experience that we're looking forward to repeat soon! 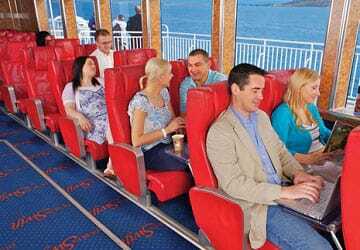 Fast, comfortable ferry. Approx. 1.5 hours versus 3 hours for others. Very smooth, too. Though my trip was delayed by half an hour the efficiency with which the cars were guided onto and then off of the Ferry was incredible. The announcer spoke with such clarity, with such a calming, interesting speaking voice that I thought "wow, I feel totally secure". The sea was somewhat choppy but all times the Ferry was spotless and comfortable. 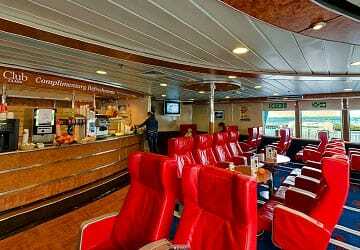 I haven't been on Irish Ferries for many years but would certainly use it again. After my original ferry become to the weather conditions, I caught the next day crossing, and I cannot fault the staff or crew, vertical helpful and friendly service, thank you. "Bike tour of Southern Ireland"
Very good service that ran on time, on the way back we received a text from Irish Ferries and a call From Direct Ferris to tell us that we needed to change from the high speed ferry due to bad weather conditions. Very simple process that worked well and would happily use this service again from Holyhead. Home and away, the trip, service and experience was comfortable and joyable. "Good but not on time"
Everything was OK except that the journey supose to be 2 hours but not 3 as happened. If I knew I would take cheaper ticket as for me timing was crucial.